We found a great little Thai place for my *real* birthday dinner. I discovered it by searching Yelp for pad thai in our area. Two good reviews came back from Concerto Fusion in Morrisville (which is pretty much the same place as Yardley... the boundary is impossible to locate), and the menu looked good on their website, so we went for it. We ended up not arriving until almost eight o'clock, and despite the fact that it was open until 10pm, we had the restaurant to ourselves after the first ten minutes or so. The ambiance is absolutely beautiful, and I'd definitely recommend wandering in just to see the lighting, waterfalls, glass, fish, and everything. The tables were very nice, but the height is a bit awkward -- there was probably only an inch of space between our legs and the bottom of the table, making the smallest gesture like putting a napkin in your lap rather difficult. We started with a red dragon roll, which is eel, cucumber, and avocado, topped with tuna and tobiko. It was pretty good, but the eel was actually too fresh for me (aka it was still warm from having just been cooked). There are a lot of sushi specials, and we're planning to go back some Thursday when they run sushi specials during happy hour. I went with the pad thai, of course. Prawns with no peanuts and extra lime (but I still could have had more lime than the extra I was given). I was slightly concerned initially since it had the spiciest indication on the entire menu, but it was the same as usual pad thai, so nothing to worry about. 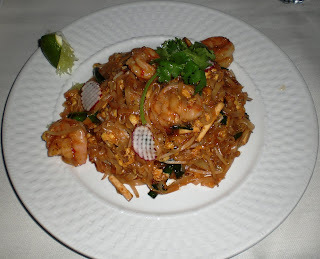 It was delicious, definitely in the top 3 pad thai dishes I've ever had. A great mix of sweet and spice, and even the tofu had good flavor. 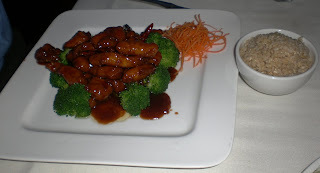 Jonathan ordered the General Tso's Chicken with brown rice. It was a perfect flavor, plentiful in portion, and came with really green broccoli. Jonathan finished his meal, but I had a great lunch the next day with the leftovers. I really can't emphasize enough how wonderful the meals were... I can't wait to go back and try other dishes there... and the whole thing was just so pretty! To finish off my birthday, we shared a piece of Dollar Cake from SuperFresh. I call it that because there's a refrigerated case at one of the local grocery stores that sells day-old slabs of sheet cake for $1 a piece. There's different flavors and fillings, and the pieces are generally about 4 inches x 3 inches, so you get a lot for your dollar. It was yummy (yellow cake with vanilla whipped cream frosting).